Everybody who grew up going to Sunday School in a Christian church knows the stories of the boy Samuel being called by God three times but thinking the calls were from the priest Eli, of Saul being anointed by Samuel as the first king of Israel, of David slaying Goliath, and of Solomon solving a dispute over a child by ordering that the child be cut in half with each claimant getting a portion. But those offer just a glimpse of the richness that can be found in the Old Testament accounts of the lives and deaths of these important leaders. 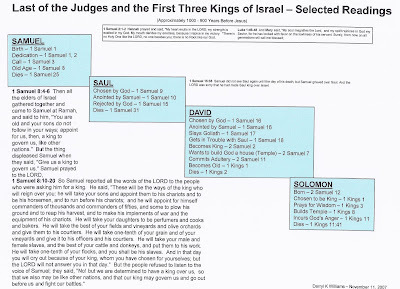 Samuel was the last of the judges of Israel because his sons were not seen as suitable successors and the people were demanding a king. After all, everybody else had a king. Samuel’s warning to the people of what a king would do resonates today as we see kings still failing and falling in the Middle East. His words might even serve as an advance warning to us as we tend to look to presidential candidates as all-powerful solutions to all our problems. Are we looking for a king or a savior? The mysterious encounter between Samuel and Saul whom he anoints as the first king and whom he helps find some missing donkeys, ending with Saul in a “prophetic frenzy,” is not typical Bible story material. The X rated encounter of David and Bathsheba, ending in the murder of Bathsheba’s husband, is as racy as modern TV shows and movies. And, we don’t spend a lot of time talking about God’s anger with Solomon, led astray by his seven hundred princesses and 300 concubines, and Solomon’s final failure as a King. The outline below highlights key points of the stories of these four leading characters in Jewish and Christian history. Read and enjoy. Pay special attention to the story of Samuel’s mother, Hannah, and Samuel’s birth and upbringing. There are interesting parallels between Hannah’s prayer in 1 Samuel 2 and the prayer of Mary the mother of Jesus in Luke 1. Click on it for a high-resolution view.